Some of the Coleraine players prior to the event. There was great success for the Coleraine Judo Club at the Northern Ireland Schools Championships last weekend. 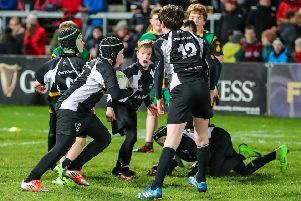 This is a development competition that enables primary (P4-P7) and secondary school children to compete against each other by representing their schools rather than their club, unless they are in a school club. The Coleraine Judo Club fielded players from most local schools and had a total haul of seven Gold, four Silver and eight Bronze medals which was their best ever result. Especially noteworthy was Caitlin Henry’s win which was her sixth major title this year and Charles Jack who fought like a lion but injured his knee in his bronze medal contest. The event was held in the purpose built Foyle Arena in Londonderry and was organised by the Northern Ireland Judo Federation. The Coleraine team was supported by coaches Paul Price, Philip Duncan and Mark Woodall while Peter Cuckoo and Richard Briggs were officiating. The club wishes to thank those parents who attended to support their children at the event. The club is closed from Friday 29th June for the summer holidays and they will resume in the September. Meanwhile the Wednesday night session (7:30 - 9:30pm) will continue throughout the summer.